Dogs, the Force, and Seagal all run wild. After twenty years of directing commercials and shorts, Nick Robertson has made his feature directorial debut with an entry in the "nature run amok" sub-genre of horror, a film that shares its title and some ideas with another killer dog movie that came out in 1977, but is not actually a remake of that earlier film. An Australian production scripted by Evan Randall Green, Robertson's The Pack centers on the Wilson family, led by Jack Campbell and Anna Lise Phillips as Adam and Carla, a couple whose decision to move their family to a remote sheep farm nestled in a picturesque patch of countryside may not have been the best idea. Carla's animal clinic is doing okay, but Adam's sheep keep turning up dead with their throats torn out. Not only is the family struggling to make ends meet with the bank breathing their necks, but their location leaves their young son Henry (Hamish Phillips) to just wander around the property all the time, and has their teenage daughter Sophie (Katie Moore) upset that they're living too far out of town to pick up a mobile phone signal. She can't even leave the place on her own because her parents won't lend her their vehicle. Their decision to live such an isolated life really backfires on them when the perpetrators of the sheep killings rear their growling, not-so-ugly (I'm too fond of dogs to really turn against them) heads; a pack of wild dogs that are unusually strong, extremely aggressive, and ravenously hungry for human meat. The dogs surround the Wilson home, trying to bust in so they can reach their intended prey. Carla theorizes that their unprecedented behavior may be the result of feral interbreeding, but on this night the hows and whys of how these dogs came to be and decided to become maneaters are irrelevant - the Wilsons just need to fight to survive. And that's pretty much the film in its entirety, roughly 35 minutes of build-up to 50 minutes of siege that's like Night of the Living Dead on four legs. Once the dogs arrive at the farmhouse, everything the characters have been dealing with up to that point kind of goes out the window - their financial issues really just served to introduce a rude banker manager so we can hate him and then relish seeing him get torn apart. 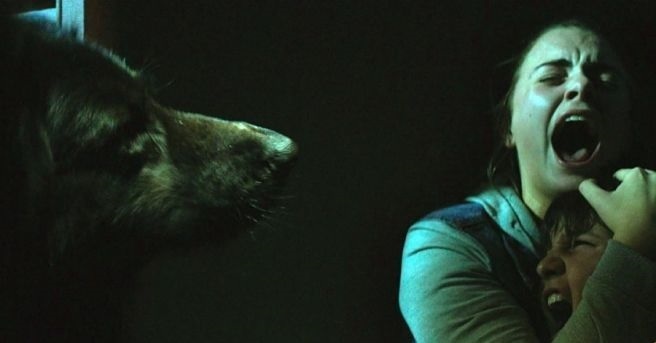 Played by German Shepherds who were dyed black, the dogs are effectively menacing, with Robertson making the wise choice of keeping them offscreen as much as possible, including in the attack scenes, which are mostly realized with quick cuts of blood and gnashing teeth rather than long shots of dogs gnawing on stunt performers. The actors all do fine work with the material they're given, with Hamish Phillips and Katie Moore making very impressive feature debuts here. There were a couple of elements that hindered my enjoyment of The Pack, though. One thing that got to me was the fact that once night falls the film's cinematography, which is dreary even during the daylight moments, gets incredibly dark. 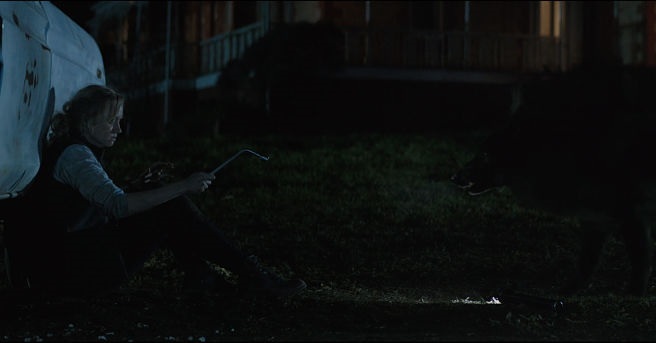 Darkness tends to be important for a horror film, but sometimes you can go too far, and at times it would have helped if the imagery here was a little brighter. The other issue comes out of Robertson's admirable attempt to make the film a serious, intense, unnerving experience. He milks the hell out of moments of suspense and tension, to the point where I lost all feelings of tension and instead had to struggle to keep my attention on the screen. 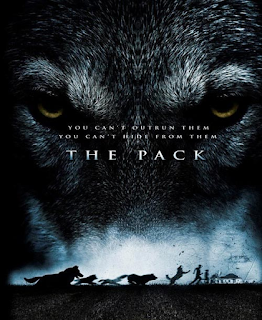 The Pack only runs for 88 minutes, but something about the tone and pacing made it feel much longer than that for me. I was expecting to get more entertainment out of The Pack than the movie had to offer, but it is a solid film, a simple story well told and carried on the shoulders of a capable cast. If you're into killer animal flicks, you'll probably get some enjoyment out of this one, and if you're wary of these types of movies because you're an animal lover, the action is shot in such a way that it shouldn't be too traumatizing for you. Star Wars is something that has always been a part of my life. I've never been a massive fan of the franchise, but I have always been a fan. The latest installment reached theatres on December 18th, but I didn't manage to catch a viewing until January 31st, at which point it was already closing in on $2 billion at the global box office. I was late to the party, but the theatre was still packed. This series is something that I'm likely to write about in more detail sometime down the line, but for now, I just wanted to quickly acknowledge that I did see The Force Awakens, and enjoyed it quite a bit. I found the two new leads, Rey and Finn, to be very likeable characters; I thought the conflicted Kylo Ren was a very interesting villain; and felt that Harrison Ford gave the most engaging performance that he has in years. Han Solo was back, and Ford was showing some of that flare that made him so great in the '70s and '80s. 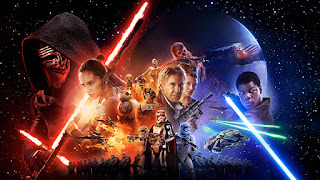 At a point late in its 135 minute running time, The Force Awakens was starting to wear out its welcome for me, it was going on a bit too long, but then it delivered some fantastic pay-offs in the last 20 minutes or so and I left the theatre very satisfied with the film overall. It even almost made me cry. I can't wait to see how the stories of these characters will continue in Episodes VIII and IX. Steven Seagal began training in aikido in his early teens, and by his early twenties was a highly skilled instructor. Living in California, he had a couple brushes with the film industry - working as a martial arts coordinator on the 1982 John Frankenheimer film The Challenge and as a martial arts instructor on the "unofficial" 1983 James Bond film Never Say Never Again. The story goes that he accidentally broke Sean Connery's wrist while working on that movie. But it was one of his students, talent agent Michael Ovitz, who really kickstarted his movie career. Convinced he could make a movie star out of anybody, Ovitz had Seagal show off some moves for the executives at Warner Bros. and Seagal walked away from this demonstration with a movie deal. Studios were extravagant in the '80s and into the '90s. It's hard to imagine a major studio today throwing $7.5 million at an unknown aikido instructor to make a movie with, even allowing this totally unproven guy to help build the project from the ground up and produce it. 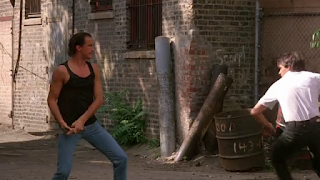 Seagal concocted the story for his screen debut with director Andrew Davis, who had three features on his filmography at that time; the musical drama Stony Island, the slasher The Final Terror, and the Chuck Norris vehicle Code of Silence. Davis then fleshed the story out into a screenplay with Alien/Total Recall screenwriter Ronald Shusett and his King Kong Lives co-writer Steven Pressfield. Also known by the title Nico, Above the Law centers on the character of Nico Toscani (Seagal, of course), and takes the unusual approach of opening with a quick biography. Nico was born in Sicily, his family immigrated to Chicago when he was 7, he soon became fascinated by martial arts, was training in the Far East at 17, and in 1969, at the age of 22, he was recruited into the CIA. In 1973, Nico bails on the agency after seeing something he strongly disagrees with while serving in Vietnam: off-the-books operative Kurt Zagon (The Tall T's Henry Silva) torturing people for interfering with his opium deals. After that, Nico moves back to Chicago, becomes a cop, marries Sara (Sharon Stone), and is partnered with Delores Jackson, who is played by one of my favorite actresses, '70s superstar Pam Grier. That brings us up to date, 1988, where we're eased into Nico's life by watching him kick the asses of a bunch of guys hanging out in a bar not in the line of duty but as a favor on the side to a family friend, retrieving a teenage girl from a drug-fuelled dalliance in an upstairs room. This is meant to endear us to Nico - he's not only a dedicated police officer, but also doesn't hesitate to use violence to take care of his friends and family. Bonus: as he's dragging the dirtbag the girl was with out of the bar, the guy gives him a tip on an upcoming big time drug deal. It takes a lot of gunplay and some vehicular action to thwart this drug deal, and in the end Nico and his fellow officers realize they haven't actually intercepted a shipment of cocaine. Instead, they've got a load of military C4 on their hands. Continuing the investigation, Nico soon realizes that Zagon, that guy he met in 'Nam that fateful day 15 years earlier, is responsible for bringing the explosives into his city and is plotting to assassinate a senator who has been looking too deeply into the drug smuggling business for Zagon's liking. There's also a side plot about priests and nuns harboring refugees and information that was supposed to be passed along to the senator, and all of this unfolds in a way that is way too convoluted and not very interesting. This film has a lot of police procedural stuff to it, and when that's going on I start to zone out. Seagal also has a tendency to try to work messages into his films, and he certainly was pushing a viewpoint in this one, trying to deliver something a bit deeper than the average actionfest. Luckily, as Nico follows the trail to Zagon he does have to battle his way through multiple groups of criminals and assassins, allowing explosions, shootouts, fisticuffs, and even a machete fight to ensue. That draws me back in. Maybe that machete scene is what inspired Robert Rodriguez to cast Seagal as the villain in Machete twenty years later. 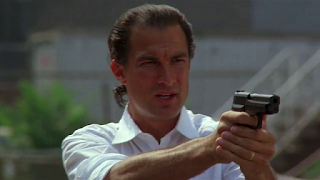 I grew up watching Seagal's early films, but I never was as much of a fan of him as I was of his action contemporaries. I always found something off-putting about him, something a little sleazy. He's not a particularly likeable screen presence... but he sure could crack skulls with the best of them back in the day. 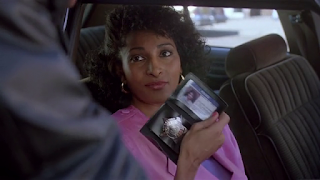 Despite the fact that Pam Grier has a healthy sized role, I don't enjoy Above the Law all that much, but revisiting it after more than twenty years did bring back some pleasant childhood memories.